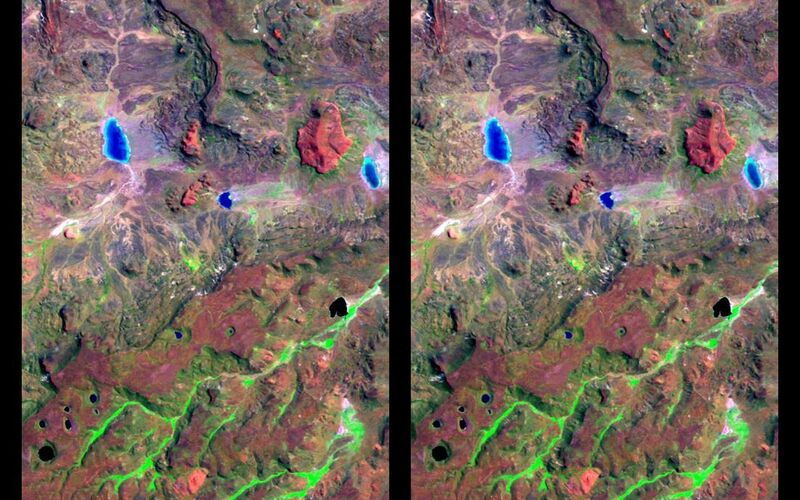 This view of northern Patagonia, near El Cain, Argentina shows complexly eroded volcanic terrain, with basalt mesas, sinkholes, landslide debris, playas, and relatively few integrated drainage channels. Surrounding this site (but also extending far to the east) is a broad plateau capped by basalt, the Meseta de Somuncura. Here, near the western edge of the plateau, erosion has broken through the basalt cap in a variety of ways. On the mesas, water-filled sinkholes (lower left) are most likely the result of the collapse of old lava tubes. Along the edges of the mesas (several locations) the basalt seems to be sliding away from the plateau in a series of slices. Water erosion by overland flow is also evident, particularly in canyons where vegetation blankets the drainage channels (green patterns, bottom of image). However, overland water flow does not extend very far at any location. This entire site drains to local playas, some of which are seen here (blue). While the water can reach the playas and then evaporate, what becomes of the eroded rock debris? Wind might excavate some of the finer eroded debris, but the fate of much of the missing bedrock remains mysterious. 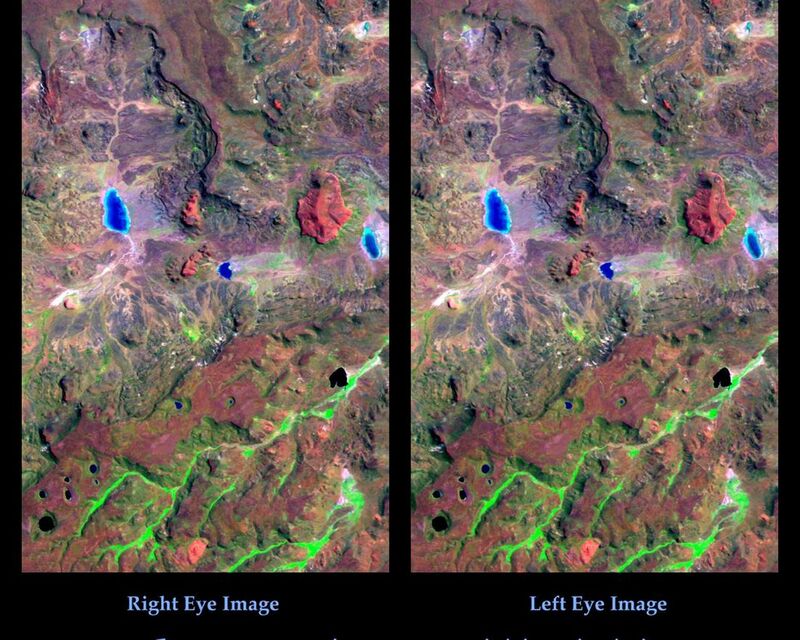 This cross-eyed stereoscopic image pair was generated using topographic data from the Shuttle Radar Topography Mission, combined with an enhanced Landsat 7 satellite color image. 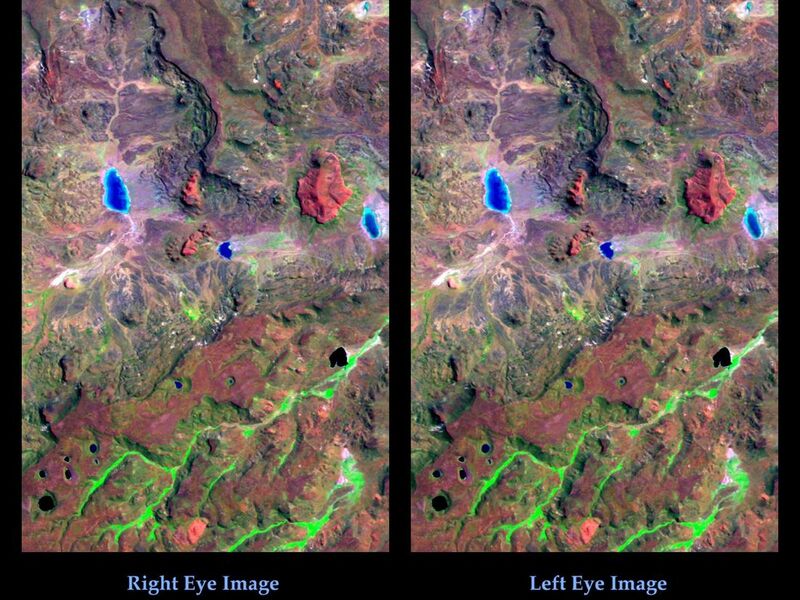 The topography data are used to create two differing perspectives of a single image, one perspective for each eye. In doing so, each point in the image is shifted slightly, depending on its elevation. 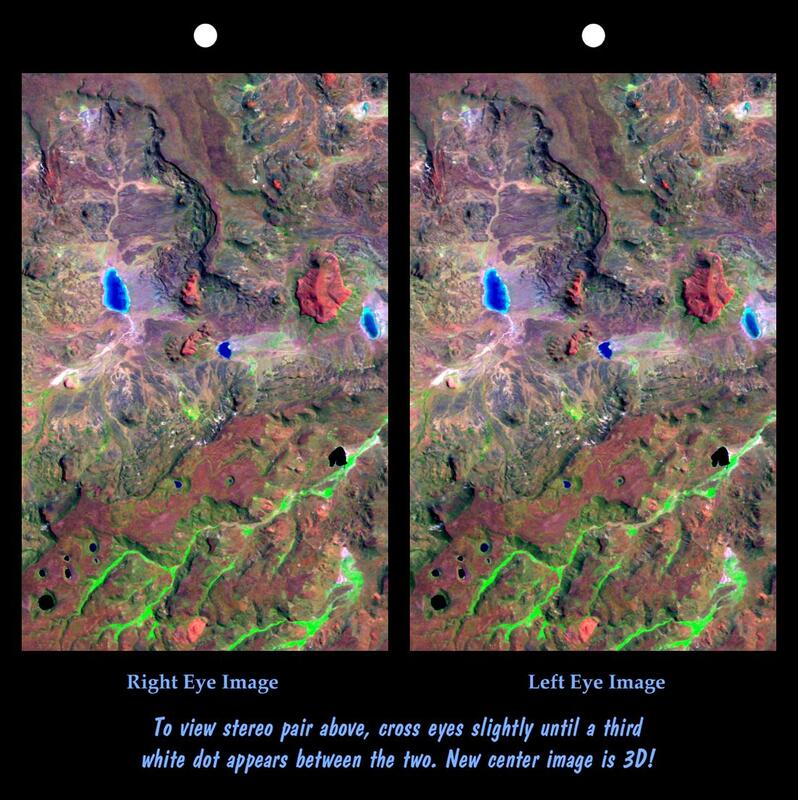 When stereoscopically merged, the result is a vertically exaggerated view of the Earth's surface in its full three dimensions. Location: 42 deg. South lat., 68 deg. West lon.